The NHS has had a rough time over the last few years. The bad press following Mid Staffs has been relentless and staff morale is low. Nevertheless the NHS is a wonderful institution – probably the greatest health economy in the world. Over a million staff perform near miracles on a daily basis. Yes it has its faults but the bad press seems disproportionate. 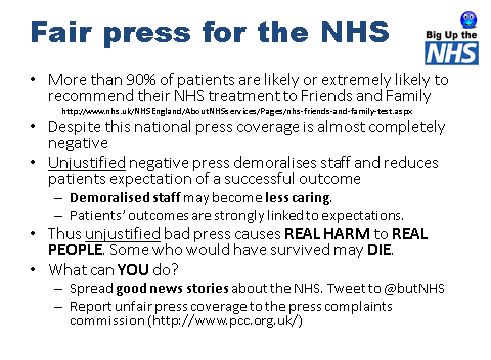 The problem is that unjustified bad press causes real harm to real people. There is strong evidence that patients outcomes are influenced by their expectations. At the very least you are more likely to be frightened and will perceive your experience to be worse if you do not have faith in the treatment you receive. Worse, there is a real evidence that your risk of complications and even death is significantly increased by anxiety and stress. Clinical staff subjected to disproportionate or unjustified criticism are also likely to feel stressed. Sickness increases, staffing ratios go down and it gets harder to demonstrate genuine compassion. Doctors and nurses are human – cut them and they bleed. So while the casual, unthinking swipe at the NHS by a national newspaper may be good for their circulation it will damage real people and some may die. On the other hand good news about the NHS will improve morale and enhance the experience of our patients. Outcomes will be better and it will become easier to make improvements. Big Up the NHS was started on Twitter (@butNHS) in an attempt to address this imbalance. It has been successful but short tweets can only give a hint of the real story. This site is a place where people can share their stories in a bit more detail. It will consist entirely of guest blogs and stories submitted from patients, public and NHS staff. I hope the quality will be high and it will be a place that you come for information and inspiration for many years to come. complain about poor service in a constructive way and just as importantly to praise and say thank you to the myriad of caring staff in all areas of the medical world. Britain along with the rest of the world have to wake up to the ageing population and realise that the growing numbers of elderly will have a significant impact on the rest of society – far from being the invisible ones they are people who go to the polls and are the largest users of the NHS, therefore the group that our politicians are most disposed to appease. Spreading good news is a positive step and I am always in favour of bringing light rather than dwelling on the negative. I have always supported the NHS and always will,they do a great job and the staff are extremely helpfull it’s a great organisation that requires all the support it can get. GovWatch is supporting the NHS and looking to that 66th Birthday on July 5 2014. I am an ordinary Joe who has had cause, both personally and through family, to avail myself of the services of the NHS over the course of my life (53 years to date). I have had mixed results over the years but on the whole, considering other than through taxation it has been free of charge, I have no real cause for complaint. It is however becoming clear that its previous and current methods of funding and service provision need to adapt to have any chance of continuing providing the care demanded of it going forward. Clinging on to outdated service levels and contracts and methods of funding won’t help anyone. If it’s time for the NHS to provide a truly 24hr/7day operation at the same service levels as they provide during the weekday then its time for the public to accept their share of responsibility in making that work. I have no problem for those who can afford to pay to go private, I do have a problem with consultants on well paid NHS contracts to provide that private care at the expense of their availability to the NHS. I would like to see all medical care for road accidents to be paid for by insurance, why should the public pick up the bill for careless driving. I would like to see sports injuries paid for by insurance, again, why should the public pay for the recklessness of adrenaline junkies or the crass tackles that get put in on the local playing fields or fight clubs. Accidents that are a direct result of drunkenness be billed in full to the drunken party at fault. Injuries due to public order offenses billed in full to the party to blame. If our modern society with all its multitude of distractions is to enjoy the continued benefit of such all encompassing health care then we have a duty to do our bit. If that means taking out sports injury insurance (just as we do if we go skiing in foreign lands) so be it. If that means moderating our behavior to not be so drunk as to lose control or to accept the health care costs of any habit we may have known to be injurious to health then so be that too. If the NHS can be freed of the costs associated with these incidents it might have a better chance of providing for those truly in need of healthcare free at point of use. In its turn those in charge of the NHS should do better for us. Be stronger negotiating with suppliers, providers and such like. It is a sad truth that those spending the public purse are more likely to be less careful as there is much less oversight and a lot more largesse than there is in the private sector. On the whole though hats off to the lot of you.